Recent years have brought much discussion among veterinarians, breeders, and cat owners on the value, safety, and necessity of some vaccines. The resultant rumors mixed with fact have caused concern among cat lovers: Does my cat really need to be vaccinated every year? Are vaccines more harmful than helpful? I ran into this kind of dilemma in 2015 when facing a move 2,600 miles from California to Georgia, which requires rabies vaccines in all dogs and cats. Rabies vaccines are also required in many of the states we drove through along the way. In that instance, we consulted with our trusted veterinarian, and based on her input, had all six of our cats vaccinated for rabies. 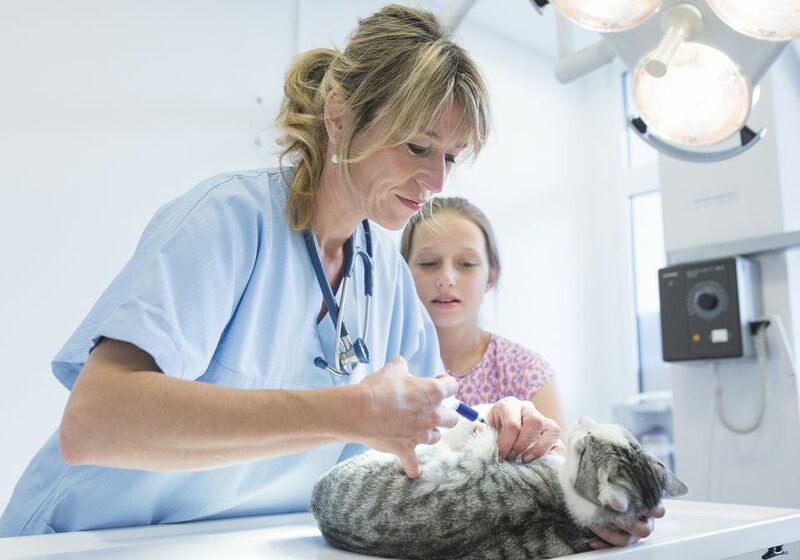 Unfortunately, there is no one answer that would be applicable to all cats, but with a better understanding of the facts, you can work with your own veterinarian to work out a vaccination scheme that will provide the safest protection for your cat. How Do Vaccines Protect my Cat? Vaccines do not inject a miraculous shield against disease. They work by fooling the body into thinking it is threatened, thereby stimulating the body's own defense system into producing antibodies to fight off the invader. Vaccines are made from either killed viruses or weakened viruses (modified live or MLV), and can be given individually, although some serums are often given as a group (multivalent), e.g. the "3-Way," or FRCP. Vaccines are most commonly given by injection, although several new intranasal vaccines have been developed, which are recommended where available. After the initial first vet visit, and "kitten shots," boosters are given to boost the cat's defense system. Traditionally, veterinarians have asked owners to bring their cats in for annual boosters, along with their annual well-cat checkup, however, times are changing and many veterinarians are moving to an every three year protocol, with some exceptions. In 1996, due to increasing concerns about tumors found at the sites of certain vaccinations, a Vaccine-Associated Feline Sarcoma Task Force (VAFSTF), consisting of representatives from American Association of Feline Practitioners (AAFP), American Animal Hospital Association (AAHA), American Veterinary Medical Association (AVMA), and Veterinary Cancer Society (VCS), researchers, clinicians, and government representatives, was formed to study this phenomenon. Their published results included certain vaccines as "Core Vaccines" (highly recommended for all cats). Another group was listed as "Non-Core and Not Generally Recommended" vaccines. Most of these latter vaccines are only recommended for cats "highly at risk." The vaccination protocols are reviewed annually, and new findings are released to members of AAFP and the other agencies mentioned above. As of the time of this writing, the 2013 Guidelines have been published in a PDF format. Most vaccines are available in either version, and your veterinarian will be able to select the appropriate one for your cat, based on his health history. MLVs seem to be the current choice of favorite, but you'll want to discuss this matter thoroughly with your veterinarian. Modified Live Vaccines (MLV): MLVs basically do their own "dirty work," in fooling the body into believing it has an outsider invader, thus encouraging it to create antibodies against the antigen. MLVs are believed to give a higher-quality immune response than that available from killed viruses. The downside is that cats with compromised immune systems (FIV or FeLV patients) may suffer from vaccine-induced disease from MLVs. Because of the risks of infection related to MLVs, it is recommended that immunocompromised cats receive killed vaccines: (1) They are not as effective as MLVs and will need to be "boostered" more frequently and (2) adjuvants have become suspect in the increase of VAS (Vaccine-Associated Sarcoma). Chlamydiosis: Because adverse reactions to the Chlamydia vaccine happen more frequently than adverse reactions to the disease, and because the vaccine does not prevent clinical infection, but just from severe symptoms, this vaccine is not routinely recommended. Households with multiple cats, catteries, or other environments where infections associated with Chlamydiosis or Conjunctivitis have been confirmed, may consider this vaccine after consultation with a veterinarian. If deemed appropriate, annual revaccination is recommended. Feline Infectious Peritonitis (FIP): Feline Infectious Peritonitis is a dread disease, however not all cats who are exposed to it will be infected.The use of the FIP vaccine has been controversial. The AAFP Guidelines indicate that as they currently lack sufficient proof that the vaccine induces clinically relevant protection, its use is not recommended. Bordetella: More commonly found in dogs, Bordetella (kennel cough) is found in shelters and other multiple-cat environments. The recently-approved vaccine has not yet been thoroughly tested as to the duration of its protection, and it is not recommended for routine use, although exceptions may be made for multiple-cat environments. Gardiasis: Another recently approved vaccine for Gardiasis is not yet recommended for routine use by the AAFP, except where exposure is clinically significant (e.g., multiple-cat environments). Sick cats, cats with chronic disease, such as hyperthyroidism, asthma, chronic renal failure, and/or weakened immune systems should probably not be vaccinated. Consult with your veterinarian before vaccinating a cat receiving cortisone therapy. Geriatric cats (10+ years) generally do not need booster vaccinations but instead can be tested for titers during their annual physical exams. Vaccinations are not recommended for kittens under six weeks, except in extreme situations (orphaned kittens, or kittens in a high-risk environment. Some vaccines are believed to cause stillbirths in pregnant queens. Much has been published about vaccine-related sarcoma in cats, particularly on the Internet. This anomaly usually occurs resulting from the rabies or more often the FeLV vaccines. Dr.Greg Ogilvie of Colorado State University, in a lecture on vaccine-induced fibrosarcomas in cats, explained a possible link with the use of aluminum in certain vaccines. Dr. Ogilvie also mentioned that there is some evidence that a cat must have a genetic predisposition to develop a tumor, which may account for the rarity of the incidence (3 in 10,000 to 1 in 1,000 cats). Because of the difficulty in establishing a clear relationship, the in 1996, the AVMA created the Vaccine-Associated Feline Sarcoma Task Force to study the true scope of the problem, the exact cause, and most effective treatment of vaccine-related sarcomas. Their findings can be read at the AVMA website. Because of the seriousness of this always fatal disease, and because the FeLV vaccine also carries risks of VAS, special guidelines have been issued for this vaccine. The disease is transmitted through saliva and nasal secretions, by biting, sharing food dishes, and other close contact. All cats should be tested for this disease at least once during their lives, and at any other time when they might have had contact with an infected cat. New cats to a household must always be tested prior to introduction to the environment. All cats with a positive ELISA screening test should be segregated from other cats. The reasoning behind this, unpleasant as it may sound, is that a VAS tumor on the leg can be treated by amputation, allowing affected cats to survive. Cats are wonderfully adaptive and usually adjust quite quickly to navigating on three legs. Fears about the possibility of vaccine-induced tumors have led many cat owners, particularly breeders, to refuse the FeLV vaccine for their cats. Presently there is no USDA standard for FeLV vaccines, therefore rating the effectiveness of the vaccines is difficult. Many veterinarians estimate the effectiveness to be between 75-85%, which lends some cat owners a reason to deny the vaccine. Personally, I'd rather risk the one in 1,000 chances of vaccine-related sarcoma against the 25% risk that the FeLV vaccination would not work. FeLV is such a deadly disease and so easily transmissible that I would not want to put my cats' lives up against a statistical roulette wheel. However, since my cats are considered "at risk," because the oldest one is still an indoors-outdoors kitty, the decision was an easy one for me and my veterinarian. People with entirely indoors cats may want to consider eliminating this vaccination, after discussing the pros and cons with their own veterinarian, but testing should be done any time their cats come in contact with other "suspect" cats. This vaccination, approved for sale by the FDA on March 14, 2002, met with resistance and controversy among both veterinarians and laypersons, for a number of reasons. Controversy over multivalent vaccines is often almost as heated as the discussions over whether in fact to vaccinate or not. Some people believe that hazards attendant with multivalent vaccines are almost as great as those with adjuvants. Others may disagree. Although the VAFSTF and the AAFP protocols allude rather cryptically to the FRCP vaccine, I have found nothing within either of their protocols to indicate approval or disapproval. Since even the medical experts disagree, it is difficult for a layperson to seize upon the right answers for his or her own cat. Indeed, the summation of the VAFSTF mentions, "Vaccination should be viewed as a medical, rather than a routine, procedure. However, the profession lacks sufficient data to accurately assess the relative risk of administering a particular vaccine or antigen to an individual cat." Before making any decision regarding the withholding of recommended vaccinations, it is suggested you do your homework. Don't use this article or any other single article as the basis for a decision, but read as many varying opinions as you can find. This article is not intended to definitively answer any questions, but to stimulate the reader into doing his or her own research. There is much more to be learned about vaccination pros and cons and I have only touched the tip of the iceberg. The bottom line, as always, is that these are issues you should discuss with your own veterinarian in deciding which vaccinations your cat needs and how often. Every household varies, and the decision is a very personal one, to be made in an informed manner rather than as a result of rumors and panic. In any case, if you and your veterinarian agree to forgo the annual vaccination scheme, make sure you still take your cat in at least once a year for a well-cat check-up and for needed dental cleaning, along with titer-checking, if that's in the plan.